Long before we all “officially” learned how to make chicken breast sandwiches, I know many who were making them. Restaurants like McDonald’s, Burger King, Chick Filet and others have made this sandwich so popular. I remember long before these famous restaurants came out with their version of the chicken sandwich, many people close to me were making their own version. Our family cooked chicken on a regular basis; usually on Sundays. Family members would always stop by on the weekend. Often they would sit down and eat with us but other times they would be in a hurry to get to some other place. This would be a time when they would grab a piece of bread (Or two) and wrap up a piece of chicken. It wasn’t anything fancy but a sandwich none-the-less and very tasty. I know because I have tried it. Another sandwich form, long before I learned how to make a chicken breast sandwich, was made with a biscuit. It used to be common to serve fresh baked biscuits with country fried chicken for breakfast. This was especially true with the southerners who moved to Ohio which is where I first learned it. One leg, thigh or other piece of chicken was placed on a biscuit. No need to remove the bone, one simply ate around the bone. Many years ago I learned how to make chicken breast sandwiches with more perfection. The main thing to know is that it is best to have a chicken breast which is the same thickness across the entire piece. This allows for even cooking. Most chicken breasts are either sliced or pounded to an even thickness, usually about one-fourth to one-half inch thickness for sandwich making. This thickness allows for quick cooking which prevents the meat from overcooking and drying. Marinades are also helpful in adding moistness to the meat if you are just learning how to make chicken breast sandwiches. Herbs, spices, oils, sauces and other ingredients in the marinade will also add flavor to the chicken. Even without using marinade herbs and spices are often used to season the chicken. Great sandwiches can be made when the chicken breast is breaded and deep fried, pan fried, baked, broiled or grilled. It is simply a matter of your preference. When learning how to make chicken breast sandwiches, you will want to use numerous of other ingredients to add taste and texture to the sandwich. Tomato, lettuce and pickle are a few of the common ones along with all kinds of cheeses. Amazing flavor comes by adding crisply fried bacon, a piece of ham, slaws, salads and all kinds of vegetables. NOTE: Chicken serving sizes should be about 4 ounces. When pounding think about the shape of your bun. I try to pound it in the shape of the bun the best I can. NOTE: These sandwiches are very filling. For most appetites, one sandwich is enough. Learn how to make chicken breast sandwiches with the flavors of Italy. NOTE: Sometimes I like to toast the buns with the cheese to melt. It is faster to place the cheese on top of the chicken, cover and let cheese melt. Cut breast in half and pound out to ¼ inch thickness; season with salt/ pepper. Mix together the egg and buttermilk; dip chicken pieces into egg mixture. Coat each chicken fillet evenly with the bread crumbs. Heat oil in a large skillet; brown chicken on both sides. Place chicken in a baking dish; pour off oil in skillet. Combine tomato sauce, basil, oregano, garlic and butter in the skillet. Bring to a boil then simmer for 10 minutes; pour over the chicken. Sprinkle tops of chicken with Parmesan cheese; cover and bake 30 minutes. Remove the cover; cover each chicken with Mozzarella cheese. Return to the oven until cheese melts; place on sliced rolls or buns. Top chicken with chopped green onion and peppers. 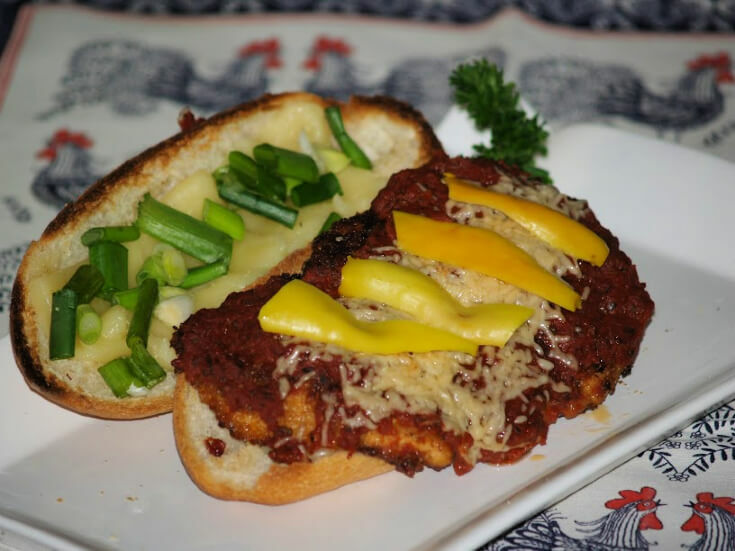 Learn how to make chicken breast sandwiches with wine sauce and Swiss cheese. FOR SAUCE melt butter in saucepan over medium heat; stir in the flour. Gradually stir in the milk cooking until thickened; stir in the wine. Remove sauce from the heat and let stand; PREHEAT OVEN TO 350F degrees. FOR CHICKEN cut breast in half; pound to ¼ inch thickness. Sprinkle with salt and pepper; mix together the egg and milk. Dip chicken in egg mixture; coat with crumbs. Heat ¼ CUP oil and 1 TABLESPOON butter in a large skillet. NOTE: Use this blend on oil and butter each time you fill skillet. Brown chicken about 2 minutes on each side; place in a large baking pan. Spoon the wine sauce over each piece of chicken; cover and bake 30 minutes. Remove from oven and uncover; top each piece with Swiss cheese. Arrange avocado slices and tomato slice on the top of each. Return to the oven for 10 minutes uncovered; arrange on buns. Learn how to make chicken breast sandwiches with cumin butter. In small bowl combine butter, chili, onion, garlic, cumin and paprika. Blend butter and spices together until smooth; set aside. Prepare cutlets to about ¼ inch thickness; season with salt and pepper. Place chicken in skillet; sauté 4-5 minutes on each side until done. Spread both cut sides of buns with butter spice mixture. Line bottom halves with the lettuce leaves; place chicken on top. Top each chicken with a sliced tomato and avocado slices. Top with a large tablespoon of the salsa; top with other half of buns. 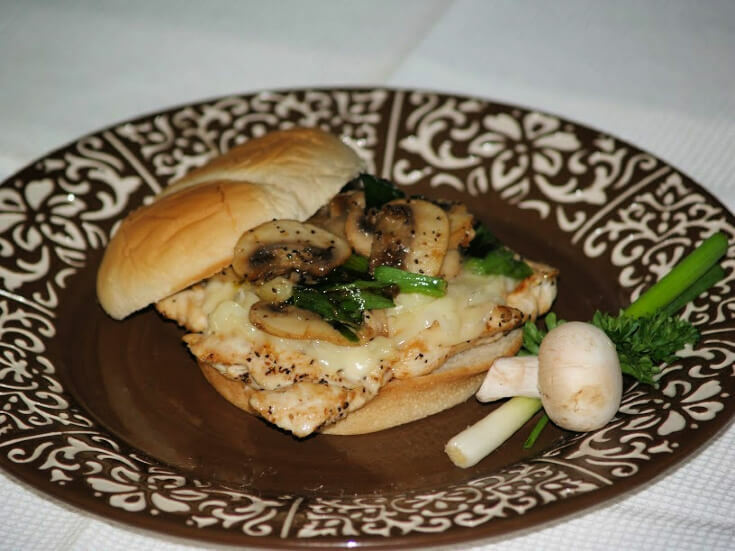 Learn how to make chicken breast sandwiches with mushrooms and mozzarella cheese. Add mushrooms and green onions to skillet. Sprinkle with salt and pepper; stir and cook 10 minutes. Remove vegetables and keep warm; add chicken to the skillet. Cook chicken about 8 minutes on each side until done. Top each chicken piece with grated cheese; cover until chicken melts. 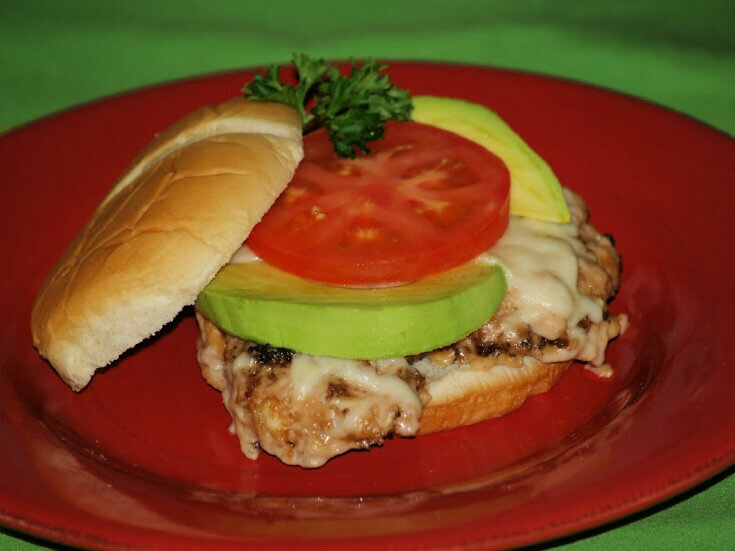 Place chicken on bottom halves of buns; top with mushrooms and green onions. Add tops of buns; serves 4 sandwiches. 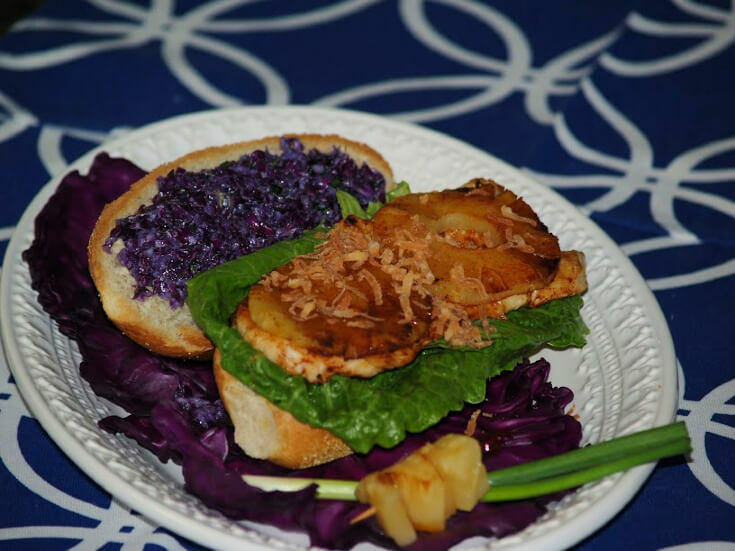 Learn how to make chicken breast sandwiches with red cabbage slaw. FOR BASTING combine pineapple juice, chili powder, molasses and hot sauce. Place chicken and pineapple under hot broiler (Or over hot grill). Cook chicken about 10 minutes on each side until done. NOTE: Baste frequently during cooking; turn chicken 1 time. Place lettuce leaves on bottom halves of buns or rolls. Top lettuce with chicken and pineapple slices. Sprinkle with toasted coconut; cover with tops of buns. Using slotted spoon scoop red cabbage slaw on top half of bun. Turn top half over onto bottom; serve each sandwich on a red cabbage leaves. TO MAKE RED CABBAGE SLAW combine all ingredients. Cover and chill slaw until ready to serve. 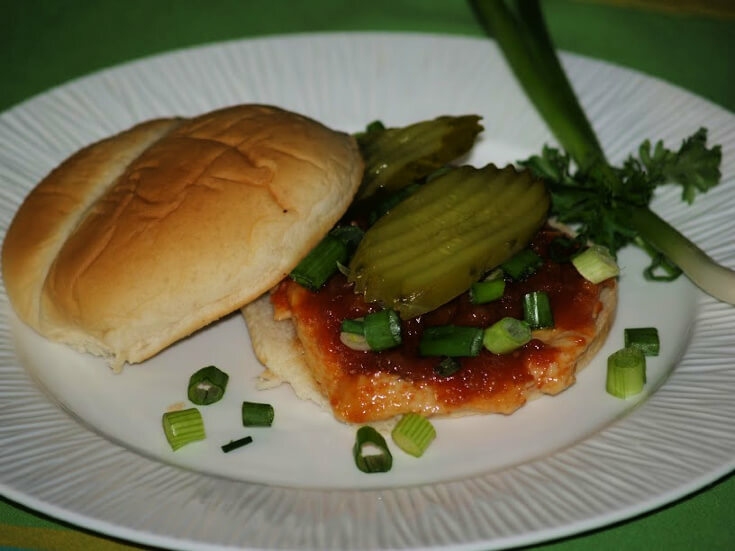 Learn how to make chicken breast sandwiches with barbeque sauce. In a skillet with lid combine ketchup, mustard, sugar, water, vinegar, Worcestershire sauce and onion. Bring mixture to a simmer; place chicken in the skillet and cover. Cook chicken until thoroughly cooked turning 1 time. NOTE: Keep chicken covered with the barbeque sauce. Place chicken on bottom halves of rolls. Top with chopped green onions and dill pickles. Top with lids to rolls; serves 4. Learn how to make chicken breast sandwiches with bacon. Brown chicken on both sides about 8 minutes on each side. Spread mayonnaise on 1 side of each slice of bread OR both halves of buns. Place chicken on bread; top each with 3 slices bacon. Top each with a slice of tomato and lettuce; top each with another bread slice. Learn how to make chicken breast sandwiches with honey mustard sauce. FOR SAUCE combine mustard, honey, oregano, water, garlic and cayenne. Even chicken pieces by cutting or pounding. Broil chicken 4 inches from heat 3 minutes on each side. Brush each chicken with honey mustard sauce; broil 4-6 minutes longer. NOTE: Baste several times turning the chicken; cook until juices are clear. Place chicken on bottom halves of buns; top with tomato and lettuce. Learn how to make chicken breast sandwiches with the flavors of Greece. Place chicken in a skillet with cover; pour water over chicken. Over medium heat bring to a simmer; cover with lid. Cook chicken until done about 5 minutes on each side. Remove chicken from pan and place on plate to cool. In a jar combine the lemon juice, oil, sugar, salt, basil and garlic; shake. In a shallow dish combine the cooled chicken, cucumber tomato and onion. Shake the lemon mixture again and pour over the chicken mixture. Cover tightly and marinate in the refrigerator until cold about 2 hours. Use slotted spoon to lift vegetables on top of chicken. Top with dollop of plain yogurt; season with salt and pepper. 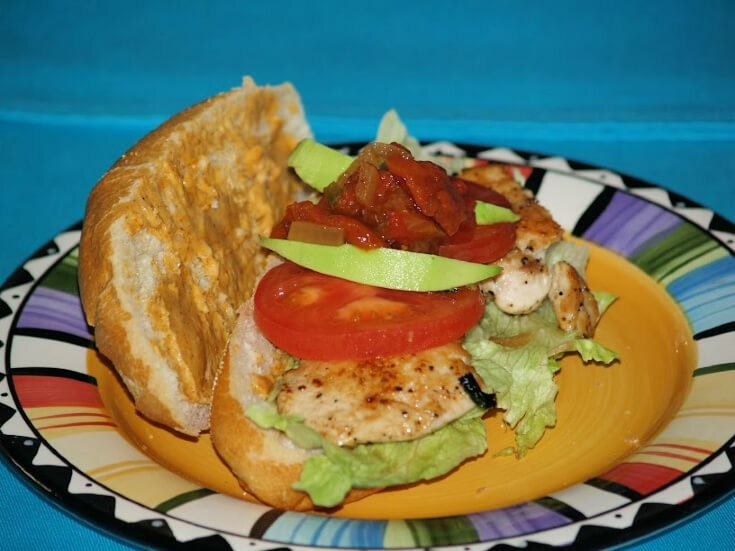 Learn how to make chicken breast sandwiches with a “zing”. Place chicken between 2 pieces of plastic wrap; pound to ¼ inch thickness. Sprinkle chicken evenly with the fajita seasoning; set aside. Combine the mayonnaise, cilantro, lime peel, juice and minced jalapeno. Pour oil in large skillet over medium high heat until hot. Add chicken to skillet and cook 4 minutes on each side or until done. Spread mayonnaise mixture evenly on bottoms of buns; top with chicken. Top chicken with tomato, onion, additional mayonnaise mixture and bell pepper. Top sandwiches with top halves of buns; serves 4.